The Freeman House (1965 – 1966), designed by Gunnar Birkerts (1925 – 2017), is a prime example of the use of diagonal elements in residential architecture. 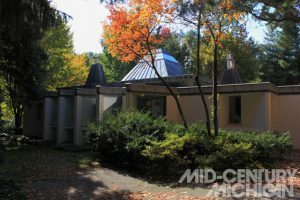 Situated on a wooded lot in Grand Rapids, Michigan, the home was designed to blend in with its natural environment, while maximizing privacy. 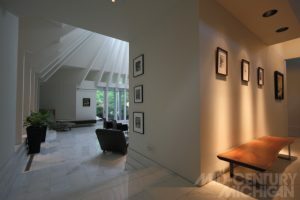 Influenced by the Bauhaus school, the structure is minimalist, yet is comfortable and livable. The house was designed to play obstruction against transparency to give the structure an intriguing, yet welcoming, appeal. 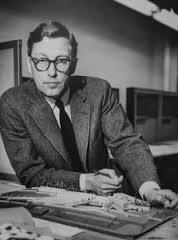 Birkerts adhered strictly to his radial grid when laying out the floor plan. All of the design elements originate from a single point and splay outward to create a floor plan replete with diagonal design elements. 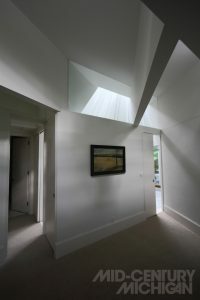 The most striking element of the design is a truncated pyramid whose apex forms a Living room skylight. 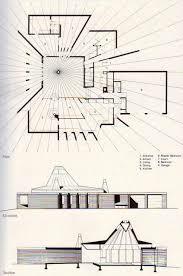 One other unusual design element is the slightly asymmetrical grid from which the house’s design derives. To enhance privacy, the outer kitchen wall is a line of repeating diagonals that alternate between brick and glass. 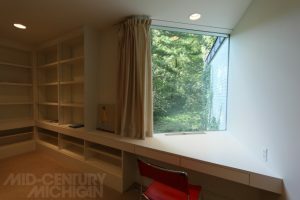 This allows for complete privacy from the street while maximizing light. Door jams follow the diagonals of the radial grid, virtually eliminating right-angled door edges. 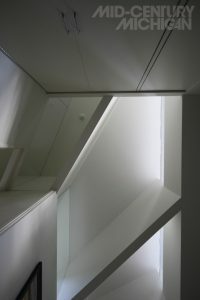 Deep triangular window sills follow the line of the walls and function as triangular built-in desks. Additional commentary: It was the owner’s desire to turn the spaces inward to an atrium. 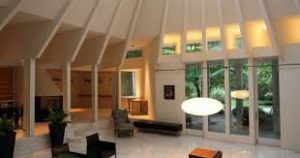 Birkerts arranged the rooms to radiate from “an eccentric center” beneath the skylight.